Don't Be Shy, Just Come On Out And Tell Everybody. . . It's hard to believe that it's already been three weeks since this little darling was born. 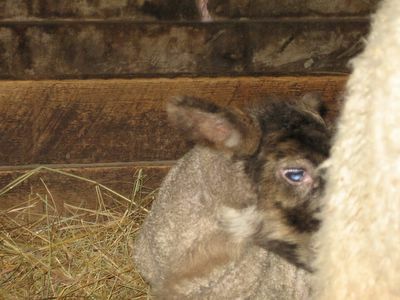 And because she was the first ewe lamb to arrive this year, that means she is the "prize" I donated back in December to the wildly successful Menu For Hope Campaign--a little lamb to call your own. Winner Jennifer New and her family are the proud honorary owners of--well, you heard her--Rose. This lovely name was chosen by Jennifer's daughter, who took no time at all in coming up with it. It just took me a while to get around to making the announcement. Meanwhile, Rose has been growing by leaps and bounds, and is thrilled that she now has three little playmates. Thanks again to everyone who contributed to the Menu For Hope. Because of your generous support, we were able to raise over $17,000 for the victims of the devastating earthquake in the Kashmir region of India and Pakistan. And for those of you who were hoping that little Rose would be yours, well, we always seem to be acquiring new critters, and you never know what I'll come up with next. Right now I'm (impatiently) waiting for 23 more sheep to have their babies. I have no idea what they are all waiting for. 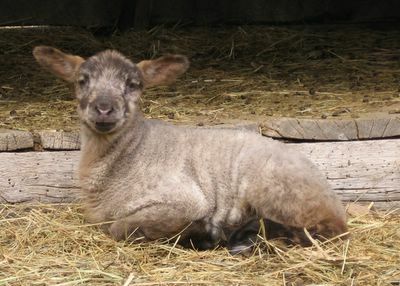 As far as names for all the other 2006 ewe lambs (of which there is only one so far), you'll just have to wait and see. I think that was an excellent choice from Jennifer's daughter! I love the second picture it looks like she is smiling, very sweet. I like the name as well. She sure has grown fast! It's amazing how much bigger she looks than the three newest ones. And I agree with Katy, she looks like she's smiling! Are her eyes really blue? And she does look quite pleased with herself. What a doll. Yes, lambs grow extremely fast. It really is amazing. If you don't pay close attention you completely miss it--suddenly they are three times the size. Yep, she's a smiler alright. 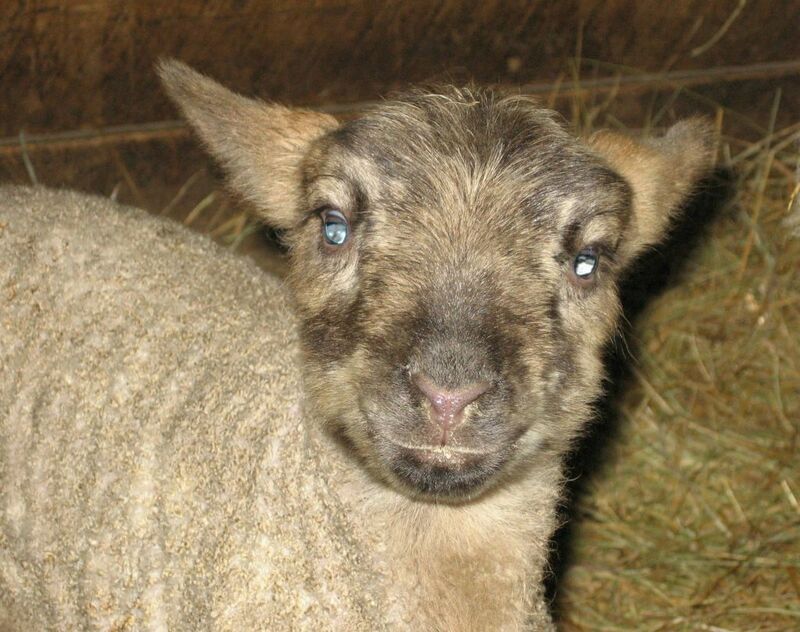 I have never seen a blue-eyed sheep before--how lovely! But then, I haven't been around so many sheep--cows, horses, ponies, goats, pigs, chickens, ducks and turkeys, yes, sheep, not so much. She sure is a pretty wee one! Came here via the Pimcess.